May 28 and 29, five wardens from the Okanagan Region of BC Parks attended part of the Region’s auxiliary ranger training sessions at the invitation of Parks staff. 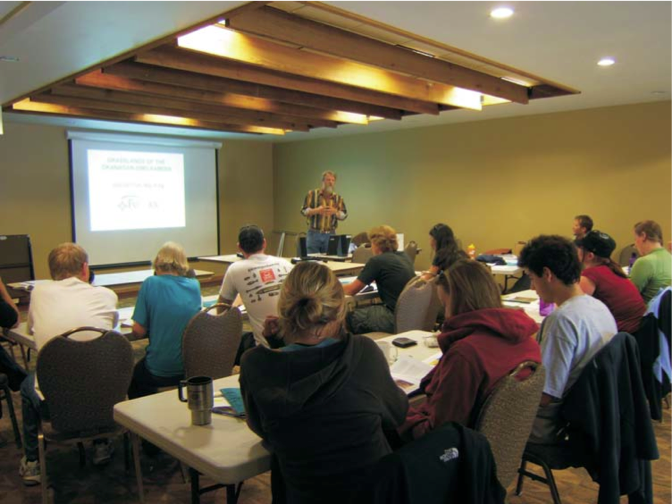 The training was held at Manning Park Lodge, a location that not only allowed for a park experience, but also was most conducive to people getting to know each other better in a social as well as a work environment. This invitation arose from the expressed wish of a number of wardens at our Regional meeting in March for opportunities to learn new skills and knowledge that would be useful in their volunteer work for the ERs. Parks staff organized the ses- sions so that the topics most likely to be of interest to wardens were consecutive, on Monday afternoon and all day Tuesday. The topics covered were invasive weeds and various control methods Parks uses, pine-beetle biology 101, the Safety Management and Prevention of Accidents Program (SMAPP) (see below) one section of which deals specifically with volunteers and their status regarding insurance coverage, and grass- land ecology and grass identification. The information on volunteers and SMAPP will be made available to wardens online as soon as possible and may be printed in The Log in a future issue. All wardens attending found the sessions very informative and likely to be useful in their work. Since all but one warden had been in the program two years or less and two had just signed up, the chance to meet Parks staff and learn about their duties and responsibilities was very valuable. The social evening and mealtimes also provided lots of chances for the wardens to get to know full-time staff and auxiliary rangers. The Parks office generously covered accommodation and meal costs for us, and the travel costs were covered by some of the funds remaining from the Regional meeting expense claims. I urge other Regions and their volunteer wardens to consider a similar sort of training opportunity. We are planning for a repeat in this Region next year and are looking for ideas on topics of interest to more senior wardens and with relevance to monitoring, studies, and research in the ERs. Good Start for New Warden By Kathryn McCourt, Warden, Mahoney Lake As a beginning ER warden, I found the presentations by Senior Rangers about the number and nature of parks, ecological reserves and pro-tected areas in their respective divisions excellent background material. It was also interesting to learn that their work is focused primarily on human users of parks rather than the other species residing there. As a naturalist and gardener, I enjoyed the presentations on western and mountain pine beetles and invasive plants. The ecological history of grasslands was fascinating, and is informa- tion that all residents of this fragile ecosystem should have. I feel privileged to have shared theses sessions with parks staff and look forward to working with them in a joint effort to preserve and protect natural areas. The Ministry of Environment’s Safety Management and Accident Prevention Program (SMAPP) includes regulations affecting officially constituted volunteers, i.e., those who have signed Volunteer Agreement forms. This includes all ER wardens. This section covers the status of such volunteers. It should be read carefully by all wardens to avoid any misunderstandings about rights and responsibilities in the event of injuries or other untoward events while carrying out volunteer duties. Volunteers who perform work or services for the \Ministry are not normally covered by the WCB for wage loss or medical benefits because they are not workers. Volunteers can sue the Ministry/its workers and other volunteers for injuries sustained while working as a volunteer. Risk Management Branch provides insurance that covers injuries to volunteer workers and insurance for their actions in the event of a third party claim. This insurance doesn’t stop a volunteer or their family from sueing for additional damages. For projects carried out by volunteers under the direct supervi- sion or direction of Ministry employ- ees, the Ministry will have owner’s responsibilities in regards to safety and first aid for volunteers. The Ministry will be required to ensure that: volunteers performing a task or operating equipment are qualified to do so; first aid requirements are up to standard; the volunteers adhere to the standards set out in the WCA, OHSR, and the Ministry’s SMAP Program; where more than one volunteer group is working that there is coordination of health and safety activities as per prime contractor responsibilities; the volunteers are informed about hazards inherent to the operations of the Ministry, generally and locally; and a safe and healthy workplace/environment is maintained. Note: A contravention of the WCA or OHSR by a volunteer at a Ministry project is considered to be a contra- vention by the Ministry.